“Anime is lame.” “What are you doing listening to all that Chinese mess, my guy?” “It doesn’t make any sense.” These are just some of the things I’ve heard from people who never took a chance on anime, the internationally popular art form that I happen to love. Critique of anime can be fair, at times. It’s foreign to most Americans, has a different sensibility, and unless you were a weird child like myself, stories about otherworldly aliens and giant, fighting robots may not have been interesting enough to drag you in. If you’re still on the edge about what to watch to get into the mix, there are some standout anime that you will immediately fall in love with. We’ve compiled the easiest starting points in anime for those with overtly Westernized viewpoints. We can only tell you how good FMA is so many times before you get it through your thick skull that this is, without a doubt, one of the greatest anime ever created. Even further, it’s possibly one of the greatest science fiction stories ever told. FMA is a mix of action and philosophy and boldly tackles topics of genocide, race, religion, and the limitations of science. If you’ve never watched anime, you must start with Full Metal Alchemist. The Brotherhood version has been dubbed by most of the anime community as the better of the two versions, but the first FMA is still very good and should be watched if you’re looking for a different storyline with a different ending. Have you ever wondered what happens to you after you die? Death Parade started as an anime short called Death Billiards, and both forms seek to answer that question. The show blurs the line between good and evil, and a lot of the episode endings are left ambiguous, leaving us to form our own opinions on who decides to go to heaven or hell. It features several hidden religious motifs, like the Greek Fates and Shiva, the Hindu god. Be prepared to realize you may not be the good person that you always thought you were. Take anime. Take hip-hop. Mash the two together and you have a dope anime complete with record scratches between fight sequences and a swordsman that utilizes break dancing to defeat his enemies in battle. There’s violence, language, and death. Also, because of the heavy hip-hop influence, this is one of the few anime that actually works as a dub. We hear the slang in the voice of Mugen and he flows with the hip-hop that plays in the background. It’s an excellent mix of Western and Eastern influences. Death Note is already being turned into a live action movie on Netflix so clearly somebody thinks it’s marketable to Western audiences. The show follows Light Yagami, one of the smartest students in all of Japan, who gets the ability to kill whomever he wants by writing their name in a book called the “Death Note.” It isn’t filled with the same anime dramatics as many other series. Similarly to Death Parade, we’re left questioning our own morality as we watch the show. It’s important to remember that anime is merely an art form; therefore, anybody can create it. It is not reserved for Japanese audiences. 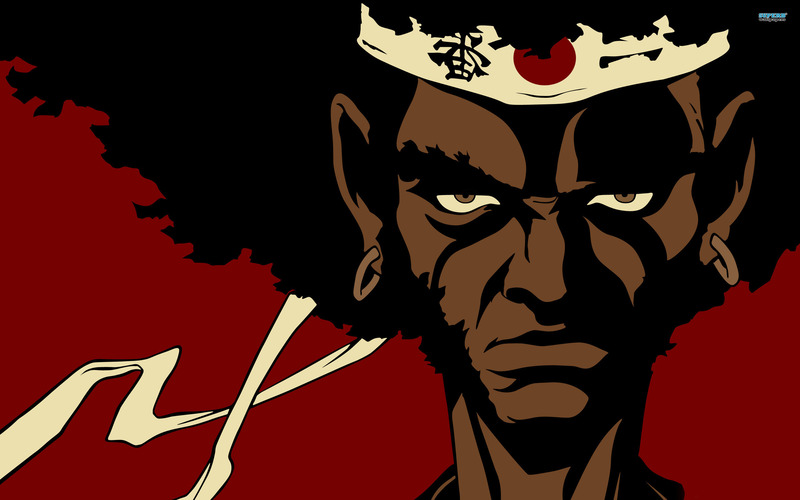 Similarly to Samurai Champloo, Afro Samurai uses hip-hop as a main part of the show. It aired on Spike in 2007 and is only five episodes long, but it has Samuel L. Jackson and features one of the dopest Black characters in anime history.